Wow, this is actually pretty accurate. I got Nitori and it is a near 1:1 match. The only differences are the obvious things like gender, look, species but except that, the only difference there is between me and Nitori is that Nitori is interested in general machinery, while I am much more interested about computers. Not that a signature matters. Yuyuko with Aya as the runner-up. I can actually see why I got Aya, but I am not sure about Yuyuko. I guess I have a lot to discover about myself haha. "Oh dear me, I've accidentally won." Ohhh Remilia top match and Suika as a runner up. Hi. Might put something new here but idk. Kappa, with Futo as Runner-up. Dayum. Marisa with Satori as the runner-up. This is fairly accurate, I've always felt like I could relate a lot to Mokou. And I agree with Reisen's down to earth attitude. Suwako, with Miko as the runner-up. It was difficult to answer some of these questions without a middle option, but it was certainly fun! From the character alone, I was confused on how it ended up like this. However, after considering the metrics, the result is quite accurate. I got Suwako, with Miko as runner up. I think the results are rather accurate. I got Sakuya and Byakuren, which is weird because my results say I'm OHKSU but Sakuya is SHKSU so shouldn't Byakuren be my closest match? Futo, with Suika as a runner-up. Actually a very well-done test from what I could see. Futo's technically not my favorite out of the characters on this list but none of the others fit nearly as well. As of AoCF, though, there's a few characters missing from the quiz according to your criteria if you ever want to update it. The net result: Yuyuko (OFKNH), with Satori as a runner-up (SFKSH). Have to say, though, some of the info on Yuyuko appear to be pretty accurate to how I act IRL. I guess I now have a good reason why I use Yuyuko as my avatar aside from being one of my favourite characters (the other being Youmu), hah. here's what it said about me. Not what I was expecting, but that's cool. Closest match Mokou, runner-up Kokoro. Well, yeah, I'd say they fit me. I got Suika, with Aya as a runner-up. Well, I'm just 14 anyways. 3. be one of the top 10 must popular characters in the latest THWiki poll. Again, sorry Rumia fans, she’s like #24. - choosing between 2 character pools - one with all 38 characters, with the other pool excluding the people who only appear in the print works / music CDs. 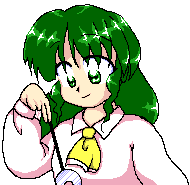 My runner up is sanae, which is pretty interesting too! Uh, I got Sakuya apparently!